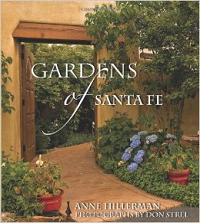 With text by Anne Hillerman and photos by Don Strel, Gardens of Santa Fe draws the reader into a close and wondrous intimacy with the snow-blanketed hush of the pond in winter, the piñon pine arching over the bronzed gate, trumpet vine spilling over the adobe wall, and bricked paths lined by pentesmon,yarrow, blue fescue, gaillardia, and feathery pampas grass. Gardeners share the especial challenges of Southwest gardening, water-wise techniques, and best plants for creating a bird and butterfly refuge. Private gardens showcase the classic, artistic Santa Fe charm of obscure courtyards and patios, and the text's final section is a grand romp through the city's numerous public and corporate destination garden spaces.